Shoulder Dislocation can be a scary experience! A lot of times, the injury happens so quickly that a patient doesn’t even know what has happened to their shoulder. But what they do know is that there is intense pain and that the shoulder joint looks deformed. How does Shoulder Dislocation Happen? A shoulder dislocation is usually caused by falling onto your shoulder, trying to stop a fall with the hand or getting hit in the shoulder. With this injury, the ball of the humerus, which is the long bone of the upper arm, has come out of its socket, which is part of the shoulder blade. When this happens, the soft tissue structures that make up the shoulder joint are also overstretched and torn. The ball of the humerus can either be moved out through the front or the back of the socket. The direction of the shoulder dislocation depends on how the hit to the shoulder occurred. 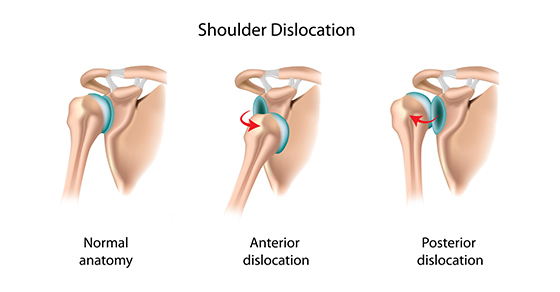 However, 95% of dislocations occur through the front of the shoulder. What can be done for a Shoulder Dislocation? For a large majority of cases, a doctor “pop” the shoulder back into place. This is called closed reduction of the dislocation. The doctor then places the shoulder in a sling to protect the joint while the soft tissues heal. The sling has to be worn between 2-4 weeks depending on the nature of the shoulder dislocation. It is important to wear the sling appropriately because the shoulder joint is now considered unstable. Until the soft tissue structures heal around the shoulder, certain movements can cause the dislocation to occur again. Therefore it is important to follow the doctor’s recommendations on the sling and make an appointment with a Registered Physiotherapist. How Can Registered Physiotherapy Mississauga Help? The Registered physiotherapy Mississauga treatment promotes healing of the injured structures. It also prevents the instability from becoming a chronic problem with a good strengthening program. Modalities such as interferential current and Ultrasound help to reduce the pain from injured tissues. Mobilization and stretching is also very important in healing. Your Registered Physiotherapist at PhysioNow will teach you everything that you need to know. Registered Massage Therapy Mississauga can also be very helpful to relieve muscle tension compensating for instability. Will surgery be required for Shoulder Dislocation? In cases where the shoulder dislocation keeps recurring because damage to the joint and/or soft tissue structures are too severe, surgery can be performed to get the shoulder joint back into place. However, this occurs only in severe cases. Hopefully, with a great Physiotherapist helping you, you will avoid this step! Call PhysioNow today to book your appointment!